The iPhone and iPad are great companions on and off the stage with the help of these amazing accessories. iPhones and iPads have become more than just media-consumption devices in so many ways. From using an iPad as a virtual cookbook to using it as a portable way to develop a website, the iPad and iPhone are extremely useful in everyday life. One of the biggest categories where these devices have made a huge difference is music. It’s now possible to take your iPad and use it as a whole collection of amps if you’re a guitar player, or have countless sounds available to you as a piano player, and so much more. Whether you’re playing a show, or creating music at home or in the studio, there are some great accessories that can make using your device even better. 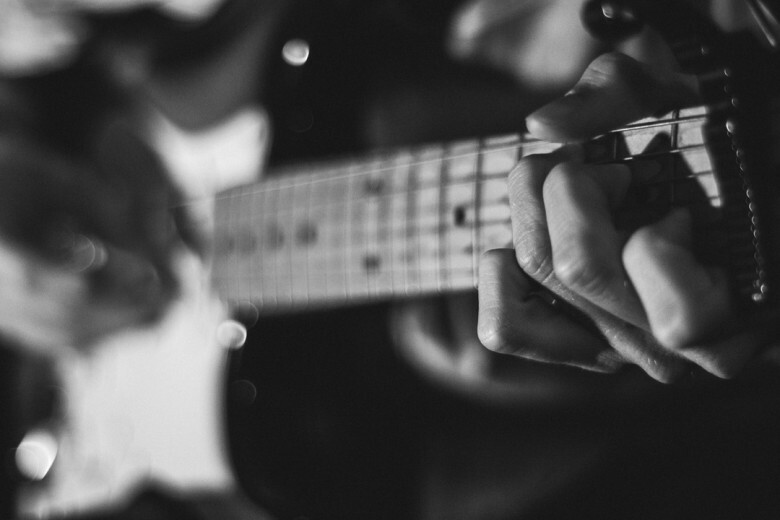 Here are six that are sure to enhance your music-making experience. 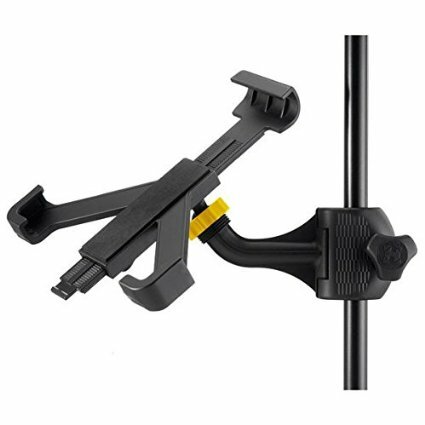 The Hercules stand features a 360 swivel and attaches your iPad to your mic stand. When you’re out at a gig, it’s inevitable that you’ll have a lot of gear to carry. One thing that makes carrying set lists, lyric sheets or chord charts a whole lot easier is using an iPad. You can store tons of information and ditch all the loose papers. The Hercules iPad Holder helps attach your iPad to a mic stand. The great thing about the Hercules is that it has a 360-degree swivel, so you can view your iPad in portrait or landscape mode. Hercules has long made solid stands and accessories, so you can trust this can take a beating on the road. The Apogee allows you to plug in and lay down tracks straight to your iPhone or iPad. There’s nothing more fun than laying down a new guitar or bass track, so having an interface that allows you to plug in instruments and record them to your iPhone or iPad is an important thing for any musician. The Apogee JAM 96K is the perfect starter interface and gives you peace of mind that you won’t forget that important song you just wrote. It’s super-portable and the quality is pretty good for its price point. Apogee is another company that has been making quality products for over 30 years! 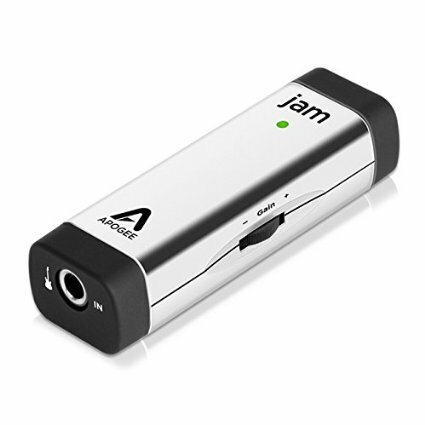 If you’re looking for a step up from the JAM, check out the Apogee ONE. 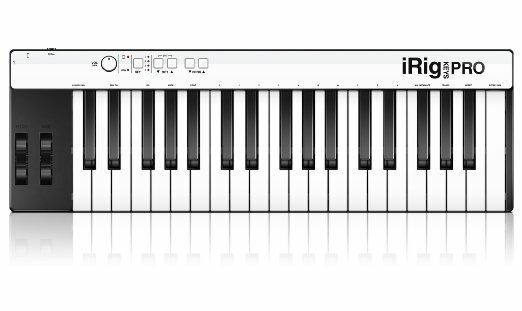 The iRig Keys is a full three-octave keyboard that can record directly to iOS devices. Let’s face it: Using the iPhone or iPad’s screen to play piano is not always the greatest experience. It works for some instruments and sounds, but is terrible for others. The IK Multimedia iRig Keys Pro is a three-octave keyboard with full-size keys that you can hook up to your iPhone, iPad and even your Mac. The great thing about the size and number of the keys is that it gives you a little room to play with two hands, rather than forcing you to play single-note musical lines (this makes a big difference). There are buttons for switching octaves and sounds, and you even get a pitch and modulation wheel. The easiest explanation for why you’d want to use a keyboard controller like this? It’s for the same reason you’d want to use an external typing keyboard for your device. Make your life easier, and pick up one of these! The iRig Pads is portable and lets you create drum beats and loops on the go. iRig Pads are another great product from IK Multimedia. There are a bunch of these types of devices out there, including some great ones from Akai, but the IK Multimedia model is one of the most portable I’ve found. 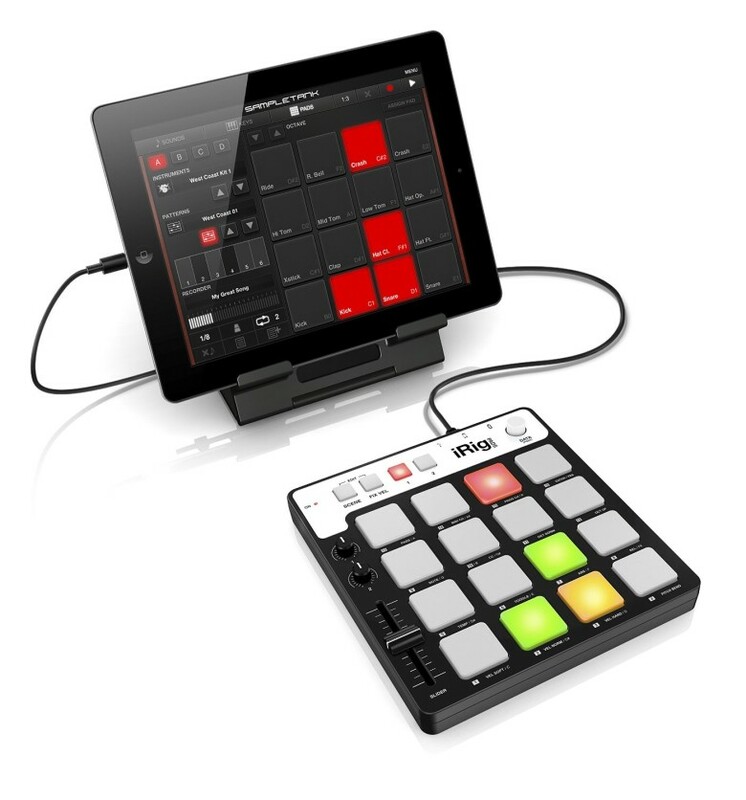 What iRig Pads does is give you 16 velocity-sensitive pads to help make drumbeats and loops. Just like its keyboard counterpart, there is nothing like having a real tactile surface to create a beat or trigger samples of sounds. A pro controller with an iPad dock built right in. Many DJs are going all-digital these days, ditching their vinyl for a computer or even an iPad. The Numark iDJ Pro is a pro controller that has a dock for the iPad built right in! One of the most important features of the iDJ Pro is the software. Many DJ controllers only come with bundled software that is oftentimes horrible to use. The iDJ Pro lets you use Algoriddim’s dJay line of apps. The software is great, and the hardware is even better. 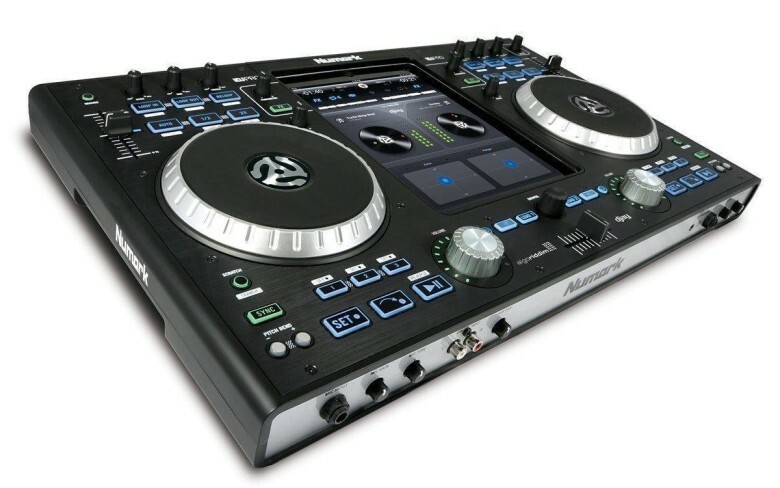 You have two decks, the ability to set loops and crossfade, and even a place to put a microphone. If you’re looking to get started DJing and you already have an iPad, this is a perfect place to begin. Two inputs plus a keyboard MIDI hookup all in one. Focusrite makes some of the best audio gear in the world. The company’s audio quality is always fantastic. 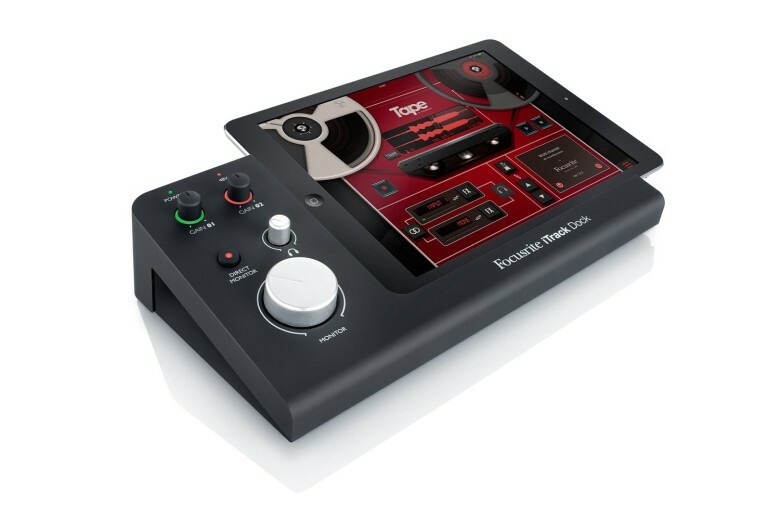 The Focusrite iTrack, like the Apogee JAM, is an audio interface. The great thing about the iTrack is that, in addition to having two inputs for instruments or even vocals, it also provides a MIDI keyboard hookup and a set of 1/4-inch outputs. The outputs make this dock perfect for hooking up to a mixer. This is helpful for playing back samples, prerecorded tracks and more (i.e., adding a string section or sound effects). If you’re looking for an iPad interface that won’t break the bank, and gives you 10 times what it’s worth in terms of features, this is a steal.